1 in 3 people worldwide consistently suffer from mild-to-severe insomnia. If you’re one of them, you’ve probably tried everything–exercising, sleep pills, melatonin–anything to snag a consistently good night’s sleep, right? Extreme sleep deprivation is certifiable torture, and even slight loss of sleep brings on a whole host of problems. A good night’s sleep sets the tone for a good next day. A bad night’s sleep–well, you know. One major factor that’s pretty often overlooked by people who struggle with getting a good night’s sleep, however, is the space in which they’re trying to do it. 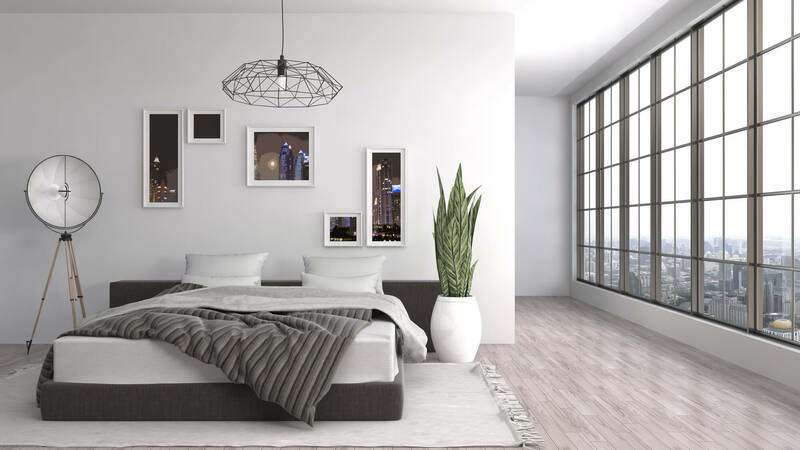 The fact is, an awesome bedroom design can actually have a huge impact on your ability to fall asleep, stay asleep, and wake up feeling awesome. If you struggle with insomnia, or simply wake up feeling less-than-refreshed after a night’s sleep, you might need to consider a bedroom reset that’ll help you to catch those extra Zs. For 7 tips on how to design a bedroom you can sleep in, pour yourself another cup of coffee and read on! A lumpy, uneven, too-soft, too-hard, too-old mattress is often a major culprit behind a crappy night’s sleep. Kind of a no-brainer, huh? Studies have shown that investment in a quality mattress provides sleepers with significant overall improvements, including a 70.8% increase in sleep comfort, 62% spike in sleep quality, 55.3% improvement in back pain, and 50.7% relief from spine stiffness. Those are huge numbers, right? Still, many who struggle to get great sleep avoid confronting this essential step. While there isn’t a one-size-fits-all lifespan for a mattress, a good rule of thumb is to assess how well your mattress is holding up 5 years in. If your mattress is between 5 and 7 years old, it might not be providing you with the support you need anymore, and honestly, you just don’t need that kind of negativity in your life. It’s important to do ample research when choosing your new mattress. Most companies understand the importance of finding the right mattress, and many offer 30- or 60-day “comfort guarantees” so you can test your compatibility before fully committing to the purchase. A quality new mattress can be expensive, but it’s a necessary investment to make; your mattress is quite literally the foundation for every night’s sleep. Did you know there’s an entire subset of psychology devoted to studying the impact of color on the human brain? This is important to note because of the ways in which your bedroom’s colors might be affecting your sleep. Maybe you’re a person who’s super into bright, vibrant, happy hues; that’s great! But your bedroom walls might not be the best place to showcase the fact. If you’re aiming to design a bedroom that’s great for sleeping, think about rolling on a fresh coat of paint in a calming color, like a muted blue, green, or pastel. Painting your bedroom walls in quiet, neutral colors will help your mind subconsciously unwind once you enter your space. If you’re still hoping to incorporate some more vibrant tones, consider bringing these in more subtly through art or decorative pillows. When you’re in bed, you’re completely surrounded by whatever bedding you choose for your space. It’s touching you everywhere, and you’re touching it right back. Yeah, sure, we’re being a little creepy here, but the point is–the bedding you choose when designing a bedroom you can actually sleep in really matters. Just like paint colors, textures of fabric can have a huge impact on your psychological state as you bed down for the night. It’s important to purchase high-quality sheets, blankets, and comforters that your body can breathe through. Consider different thread counts and types of fabrics to decide which feel best to you. The point is, you want the hardest part of your day to be untangling yourself from your bedding. Choose wisely, friend. Thoughtful feng shui serves functional and psychological purposes equally. The arrangement of your bedroom furniture should make sense; it also has to be super cozy and welcoming. Your bed should remain the focal point of the room. After all, it’s the whole reason you’re in here, right? Place your bed against an interior wall where it’ll fit naturally and avoid direct paths of light from windows as much as possible. When choosing bedroom furniture and arrangement, keep in mind the amount of space you’re working with. Nightstands should fit comfortably into the room and they should be appropriately proportional to your bed and its height. A dresser or vanity should never crowd the bed, and everything in your bedroom should leave enough space for you to breathe and make it safely from one side of the room to the other. Remember: If you feel like you’re trying to fit too much stuff into your bedroom’s available space, you probably are. Find another place for it. We’ve all been there–half-folded laundry covering most of the bed, that stack of bills toppling over across the nightstand. We’re stressed just thinking about it. A cluttered bedroom doesn’t only make it tough to find a clear space to cozy up; it also causes hopeful sleepers’ anxiety to skyrocket. It’s a proven fact that weeding-out and organizing belongings in a space such as the bedroom has tons of positive benefits, including relief from the anxieties that might be impacting your sleep. So much of your day is spent stressing over life’s clutter. Keep other, more stressful areas of your life out of your bedroom–yes, you have to leave that work assignment in your office. Take care to organize the things that belong in your bedroom so the space feels fresh and calm and everything has its place. Invest in some stylish bins or totes for storage under the bed. Quite frankly, you just shouldn’t have to worry about tripping over that stack of books on the floor when all you want is a late-night pee. One of the most important aspects of designing a bedroom that you can actually sleep in has nothing at all to do with the room’s physical design. The air that fills the free space in your room can have a huge impact on the quality of the sleep you’re getting. Temperature is a huge part of it. As your body prepares itself for sleep, its overall temperature begins to decrease. Keeping your bedroom temperatures around 60-67 degrees Fahrenheit is a great way to help start your body on its way to a restful night and refreshed morning. Consider installing a ceiling fan, space heater, or heavy window treatments aimed at regulating the air inside your bedroom. You might also look into an air purifier or humidifier, because the fact of the matter is, if you’re breathing better, you’re probably sleeping better, too. Air quality and temperature aren’t areas to skimp in your sleep space. Because of our natural inner-wirings, the human body is trained to respond to the presence of light in a room by…well, waking up. If you want your bedroom to be a place where you can get consistently great sleep, you’ll have to take care to make your room darker. Doing away with electronics entirely within the confines of your bedroom walls is a great way to darken your space and to rule out any sound-based distractions. You shouldn’t have a computer, television, or lit alarm clock in your bedroom. If you plan on sleeping, it’s just not the place for it. Consider installing a new set of blinds or black-out window treatments to block out that excess light that’s working to keep you awake. It’s also a great idea to set up dimmers on your bedroom’s light switches, as even harsh artificial light can mimic the effects of daylight, therefore impacting your sleep. Sure, you can close your eyes and use a sleep mask. But one of the biggest power moves you can make in your pursuit of sleep is take care to make your room darker. So. We’re pretty sure it’s time to trade your sixth cup of coffee for that furniture catalog you tossed on the floor by your nightstand. Design a bedroom you’ll love while you’re awake and sound asleep. Every element of your bedroom’s design contributes in some way or another to the quality of the sleep you get, whether or not you can stay asleep, and how you’ll feel when your alarm goes off. Take action to refresh your sleeping space now, before you’re too tired to do much of anything! As you settle in on your new mattress, pillows, and bedding, stop by for more information on what else you can do to sleep better tonight. Sweetnight 10-inch Cool Gel Memory Foam Mattress Review- Sweet or Sweaty Nights?